The theme for this month's Home Bakers Challenge, a monthly baking group started by Priya, is Arabic Bakes. 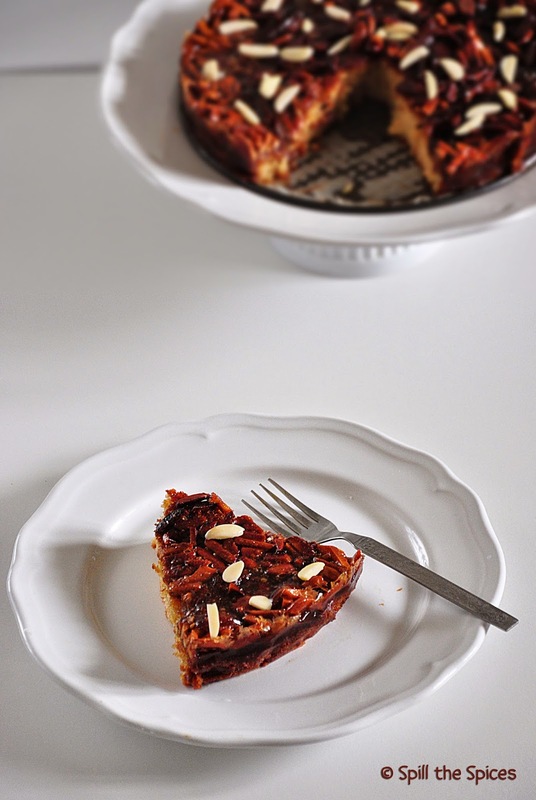 Rafeeda of The Big Sweet Tooth suggested both savory and sweet bakes for this challenge. Out of her wonderful choices, I baked this melt in mouth honey and almond cake. 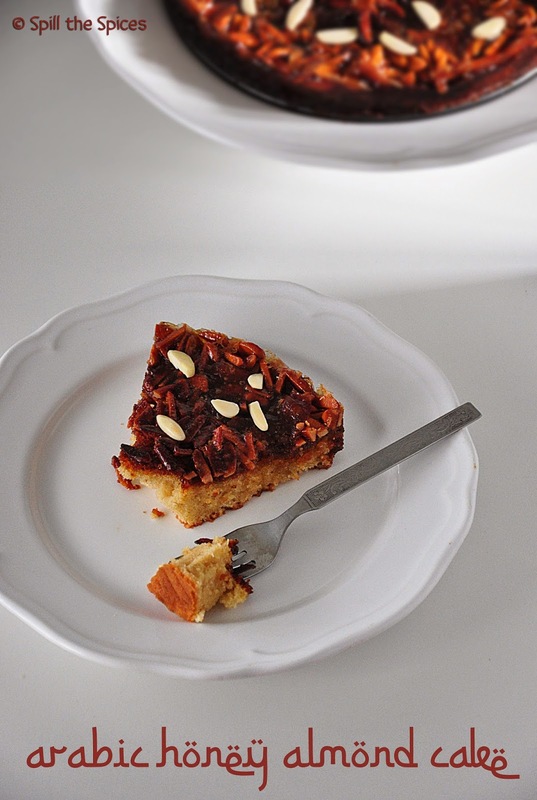 Honey cake is very popular in Middle Eastern cuisine, with nearly every Middle Eastern country having a variation of their own. 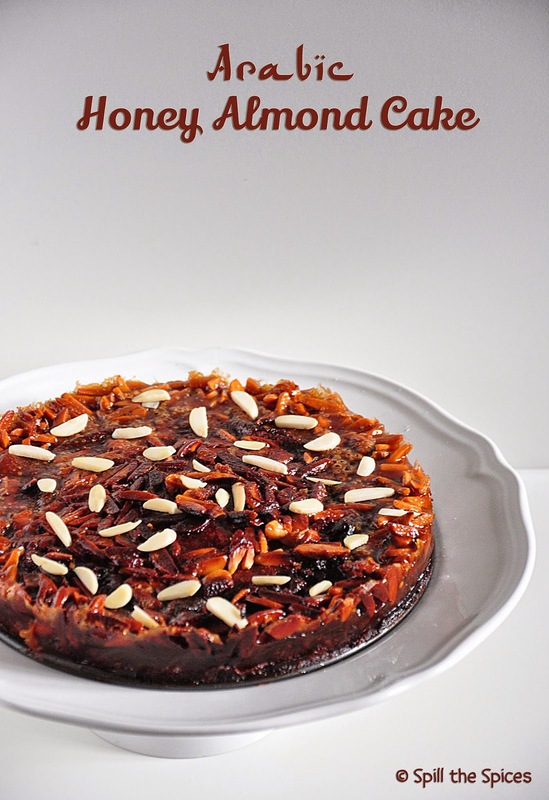 This Arabic inspired honey cake has a soft and fluffy base topped with honey and caramelized almonds. The half-baked cake absorbs all the syrup, turning the cake super soft and moist. This cake is perfect with a cup of tea or coffee. 1. Preheat the oven to 190 C | 375 F. Grease a 8-inch spring form pan or line with parchment paper. 2. Beat the eggs, white sugar, brown sugar and vanilla together until it whitens. Add the melted butter and mix well. 3. Sift the flour and baking powder together and add to egg mixture and mix gently. 4. Pour into the prepared pan and bake 10 minutes. 5. Meanwhile prepare the topping. Melt the butter in a small saucepan over medium heat. 6. Add the sugars, honey, almonds, and cinnamon. Bring to a boil, stirring constantly. 7. Pour the topping gently on the cake and return the cake to the oven. Bake for another 15-20 minutes or until completely baked. While pouring the syrup on the cake, start from the sides and pour slowly. Cant resist to this beautiful cake, lovely and very delicious topping, mindblowing they are. wow! they look sooo yumm..
Wow cake Luks super tempting..
Looks Very rich and healthy. Looks very yummy and wonderful cake. Cake looks yummy and mouthwatering, awesome clicks. Yummy cake, love the crunchy topping..
Cake looks very nicely done...topping looks very inviting.. Yes Anshu, you can bake this cake in the convection mode of your microwave oven.